During our first summer in Colorado, I discovered my love/obsession with Colorado peaches. I have honestly never tasted anything so delicious and for a couple of weeks all I can think about is eating at least one peach every single day so I don't miss out on the fleeting season. It also helps me deal with the fact that I am overheating/melting every time the temperature creeps above 85 degrees. Last year, I made a huge batch of peach jam thinking we would enjoy it all year round. But then no one ate it. It turns out people have some serious opinions about peach jam. Message received. This year, I opted for something a little different and made a peach shrub. Never heard of a shrub? It is essentially juice extracted from fresh produce and mixed with vinegar to be used as a mixer for cocktails. You can do it with just about any seasonal fruit from spring and summer berries to fall apples (which I'll be trying ASAP). And once you make it and stick it in the fridge, you have one year to savor and enjoy. I plan to sip my way through the year (or the next 6 months...depends on how long this lasts) with shrub-based mocktails like this one. Fall flavors like sage, nutmeg and apple cider blend perfectly with the sweet flavor of summer peaches. And the vinegar adds a lovely zing that most mocktails lack. With this drink in hand I'd like to say cheers to fall and thanks to summer for the lovely peaches. I'll be spending the next 10 days soaking up the fall leaves in Minnesota. If you'd like to follow along with my trip, be sure follow me on instagram! The peach shrub recipe is from my friend Jen from Use Real Butter. I doubled the recipe and tried one bottle with apple cider vinegar and one with white vinegar. So far, I've enjoyed the white vinegar best but both are quite lovely. In the bottom of a cocktail shaker, combine 2 of the sage leaves and the shrub and muddle to release the flavor of the sage. Fill the shaker halfway with ice and add the apple cider and nutmeg. 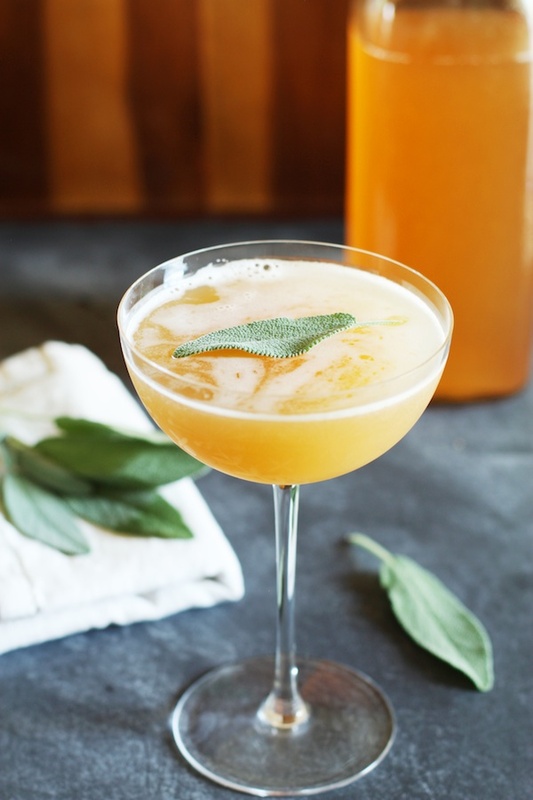 Pour into a cocktail glass and garnish with the last sage leaf.